Every year, I bring hot cross buns to an Easter brunch gathering of family and friends. Sharing food has always been sacred to me, all the more so when it’s around a spiritual event. I don’t know why I started bringing hot cross buns. We didn’t do it when I was growing up; maybe it’s my British roots, but it just seems the thing to do. (Good Friday is the traditional day, but Sunday is when we gather.) This year, for the first time ever, I am making my own, inspired in part by a recent spirituality of bread baking workshop at my church. Based on the test batch, I think it will work out fine. The hot cross bun is not complicated to make. At its simplest, it’s spiced bread. Flavor and ingredient-wise, its noteworthy for a few reasons. First, traditionally it’s made with currants, an ingredient unknown in America except in its fellow British baked good, the scone. Second, it sometimes includes bits of candied fruit — the same atrocity that afflicts fruitcake and makes it wildly unpopular. (I prefer mine without, if you hadn’t guessed.) Third, it’s only lightly sweetened, which may be a good or a bad thing, depending on your tastes. And of course, most obviously, there’s a big honkin’ cross on the top of it, usually made of white icing. I started with this great recipe, then adapted it a bit, and rewrote the intructions to make things simpler. 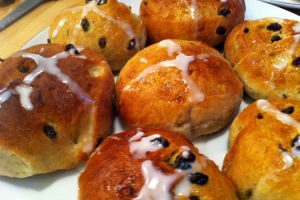 So here’s my recipe to make the hot cross buns in the picture. Enjoy! Warm 1/4 cup of milk. Stir in 1t of sugar and sprinkle in the package of yeast. Let sit 5-10 minutes until foamy. In a large bowl, whisk together 3 cups of flour, 1t of salt, all the spices and 1/4 cup of sugar. Make a well in the flour and add the yeast mixture 4T of melted butter, 2 eggs, and 1/2 cup warm milk. Mix the ingredients well with a wooden spoon. Mix in the currants and orange zest. Knead until well mixed; knead in an additional tablespoon of flour until the dough doesn’t stick to your fingers or the bowl. Form the dough into a ball, cover the bowl with plastic wrap and leave at room temperature for 2 hours — the dough should double in size. Press down on the dough to deflate it, then roll into a log and divide into 16 pieces. Form each piece into a bun. Place the buns on a baking sheet, at least an inch apart. Cover it all with plastic wrap and let it sit for another 40 minutes, until they’ve doubled again. Preheat the oven to 400°. Whisk together one egg and 1T of milk. Brush the egg wash on each bun. Put in the oven on the middle rack and cook for about 12 minutes. Remove from oven, cool a few minutes, then move to a wire rack to cool more. Whisk together 1t of milk and 3T powdered sugar. Whisk in additional tablespoons of sugar until it’s a little thicker than you think it needs to be. (As you can see from my picture, I didn’t go thick enough the first time.) After the buns are totally cooled, use an icing bag or a plastic sandwich bag with a corner snipped off to pipe a cross on each bun. Behind the description, the hot cross bun carries a surprising amount of intrigue. Even to start to tell its history lands you in controversy. We know one thing: it began in England. When and why, though, is its first mystery. While some disagree, the hot cross bun probably was a tribute to the Saxon goddess Eostre, after whom this Christian holiday got its English name. Eostre was the goddess of light, and her name was given to the month of April, which marked the return of the dominance of light, as well as of birth and new growth. Eostre ties back to the German goddess of the dawn, Hausos, who is also linked to rabbits and eggs. While the specifics of Eostre are based on an account from St. Bede which scholars dispute, the link between the German goddess Hausos, the Saxon Eostre, and the later English name and customs of Easter seems obvious. The cross on the bun began as an ancient Gaelic symbol depicting either the four quarters of the moon or the intersection of earth (the horizontal line) and Heaven (the vertical line), the human and divine, the physical and the spiritual. These meanings for the cross don’t contradict its other meaning, they enrich it, and you find them in Christianity, especially Celtic Christianity, sometimes too. Despite its pagan roots, the hot cross bun became so entrenched as a symbol of English Catholicness that when the Protestants took power they actually banned the bun. As with most government attempts to forbid something people want, however, it didn’t last long. A compromise was struck by Queen Elizabeth I, allowing them to be sold, but only during Christmas and Easter. The fact that the buns are not very sweet — just enough to balance the favors but not enough to taste sugary — is seen as appropriate for Lent. The use of currents rather than raisins, though an accident of location rather than something intentional, furthers this, since currents are less sweet and less juicy. It’s possible that hot cross buns were sometimes made with the same flour used for communion wafers, though this might have been propaganda from the anti-Catholics. I was excited to learn that in Australia they sometimes substitute chocolate chips for the currants, so I made some that way too. (I don’t abstain from chocolate during Lent.) I must say, it felt wrong. Even though the overall effect, despite the milk chocolate chips, was still not sweet, chocolate just seems too… decadent. There’s a superstuition that you can cement a friendship for the coming year by sharing a hot cross bun, saying, "Half for you and half for me, between us two shall good will be." If you ask me, I’d say that’s a self-fulfilling prophesy. But by all means, share hot cross buns with your friends this Holy Week, and consider those friendships holy and protected for the year ahead! If you’re inspired to try home-cooked buns, I’ve included the recipe I used. Have a blessed Easter. Previous postWhat Works: The Hunger Games — Is Its Violence Appropriate?